Skillet Pizza - I was in the used book store not too long ago, armed with a store-credit, and as always, ended up buying cookbooks. 'One of the cookbooks I walked away with was 'The Best Skillet Recipes' from the editors of Cook's Illustrated. 'Over the last couple of years, I have grown to love the Cook's Illustrated/America's Test Kitchen people. 'I watch the PBS show from time to time, and love the way they explain how they came to agree on a recipe. 'It's nice to read a recipe with such specific instructions and to know that it will turn out well. Even so, I was skeptical. I'd never heard of making a pizza in a skillet. However, with a day off, and all the ingredients to make a simple cheese pizza, I figured, why not try? 'Friends, this was not a disappointment. 'I'd tell you more, but I think I'll keep it simple this time. 'Also, I have a 7-page paper to write by the end of today, and am blogging to take my mind off of the question of whether or not Frankenstein qualifies as a hero. 'Any input would be helpful. 'Anyway, make this pizza. 'It was unexpectedly good, even if the process was a little unusual. I don't recall changing anything about the recipe, except that I think I tried to make the dough in my mixer instead of my food processor, which didn't work at all, and I ended up just kneading it myself on the counter. Next time I'll make it in the food processor like they suggest, since the America's Test Kitchen people are usually right. Note: You can also let the dough rise in the refrigerator overnight for 8-16 hours, and then set dough on counter at room temperature for a half-hour before using. 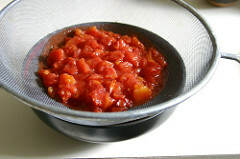 Pulse the drained tomatoes, oil, garlic, and salt together in a food processor until coarsely ground and no large pieces remain, about 12 pulses. 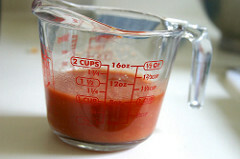 'Transfer the mixture to a liquid measuring cup and add the reserved canned tomato juice until the sauce measures 1 cup. 1. Adjust an oven rack to the upper-middle position and heat the oven to 500 degrees. 'Grease a 12-inch ovenproof skillet with 2 tablespoons of the oil. 2. 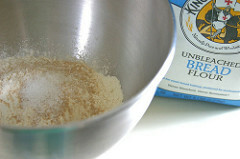 Turn the dough out onto a lightly floured work surface, divide it into 2 equal pieces, and cover with greased plastic wrap. 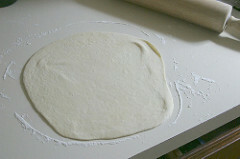 'Working with 1 piece of dough at a time (keep the other covered), press and roll the dough into an 11-round on a lightly floured work surface. 'Transfer the dough to the prepared skillet. 3. 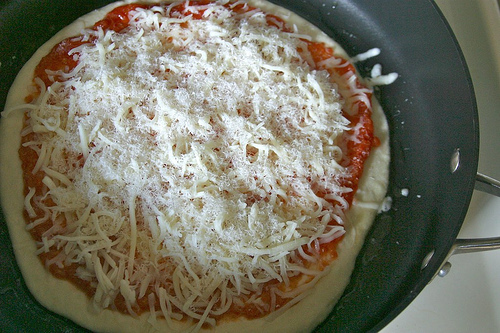 Spread 1/2 cup of the pizza sauce over the dough, leaving a 1/2 inch border around the edge. 'Sprinkle 3/4 cup of the mozzarella and 2 tablespoons of the Parmesan over the top. 'Set the skillet over high heat and cook until the outside edge of the dough is set, the pizza is lightly puffed, and the bottom crust is spotty brown when gently lifted with a spatula, about 3 minutes. 4. 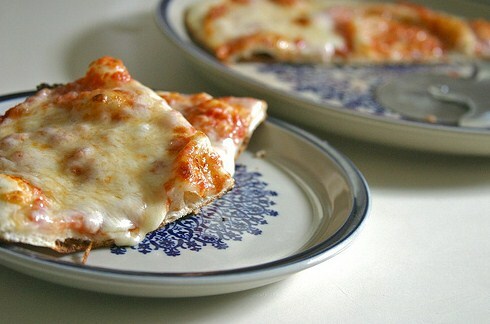 'Transfer the pizza to the oven (keeping it in the ovenproof skillet) and bake until the edges are brown and the cheese is golden in spots, 7-10 minutes. 'Using pot holders (the skillet handle will be hot! 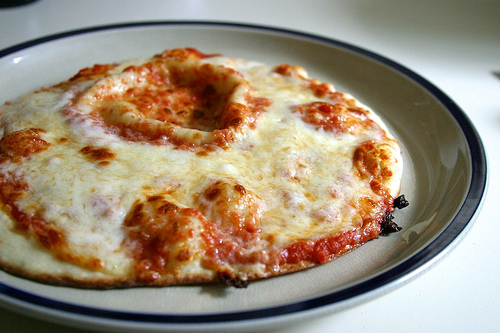 ), transfer the pizza to a carving board, slice into wedges, and serve. 5. Wipe the skillet clean, let it cool slightly, then repeat with the remaining 2 tablespoons oil, remaining 3/4 cup mozzarella, and remaining 2 tablespoons Parmesan to make a second pizza.